The holiday apartment is approx. 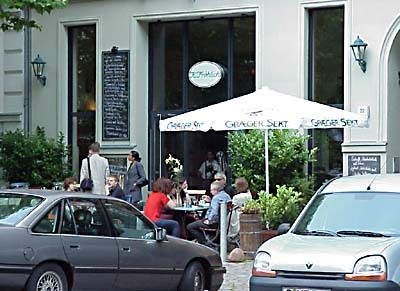 36 m² and lies the the centre, just 1200 m from Alexanderplatz (Mitte-district and historical city centre) in the district Berlin - Prenzlauer Berg, near the lively Kollwitz Platz, the heart of this East-Berlin region. You can get on the 24-hour Metro-Tram M2 right in front of the house and it only takes 5 min to Alexanderplatz. 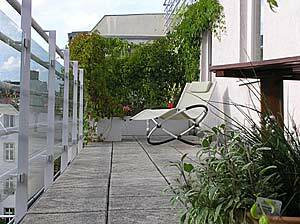 It has a 22 m² terrace with a wonderful view over the rooftops of Prenzlauer Berg, since it is located on the sixth floor (with elevator). The house is a new building with elevator and underground car park. 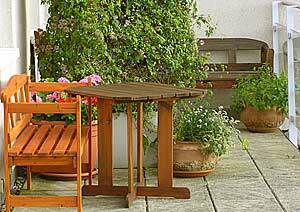 The holiday apartment is ideally suited to couples, small families and senior citizens. 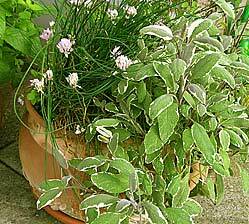 Smoking is only allowed on the terrace. 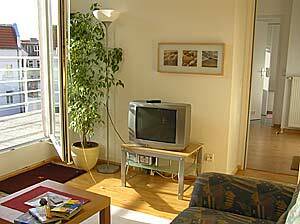 The holiday apartment is arranged in a modern fashion. The living room and bedroom are separated with a room divider (shelves) and has two beds, an additional bed-couch and cable TV. Your own bathroom has a large bathtub (also for showering) and WC. 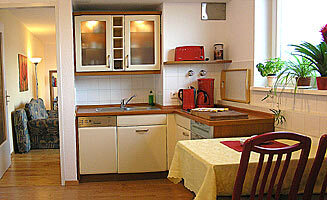 The modern kitchen comes with everything you need for a short stay in Berlin (microwave, dishwasher, with electric stovetop, refrigerator, coffee maker, toaster, dishes). A cot is available on request. Furthermore there is a wardrobe beside the bath, hair dryer, iron with ironing board as well as a city map, books about Berlin in different languages, radio, CD-player, different family games and two umbrellas. 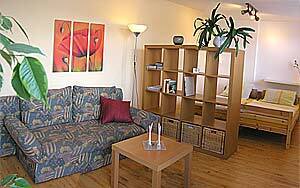 The holiday apartment is very quietly located, with the windows all facing south west onto the large, green court. Extra charge for late-arrivals after 08 pm: 10 euros 10pm: 15 euros, from 11 pm: 20 euros and from midnight: 30 euros. Peak season: March - October, Christmas/New Year's Eve: 22.12.-06.01. You pay a minimum of 50 % in advance and the rest cash when you arrive. Only last minute booking: you pay 100 % when you arrive. Prices incl. 7% VAT. Bedlinen, 1 towel and 1 bath-towel per person, toilet paper dishwasher-tablets, washing up liquid are all included in the cleaning price. 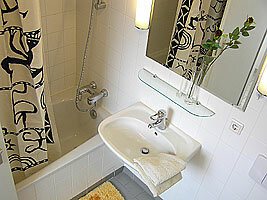 Further towels and bathrobes in different sizes can be borrowed for a extra charge from us. Parking is controlled in front of the house. This means that parking comes with a charge of 1 Euro per hour, Mondays to Saturdays from 9am to midnight. Parking spaces without a charge can be found 5 tram stops away (northern Prenzlauer Berg). It is also possible to rent a space in the parking garage for 8 Euros a night (maximum vehicle height is 1,5m), or park in the garage a few hundred metres away. Your own or rented bicycle (you can rent one around the corner from 6 euro/ day) you can park in the locked courtyard. . The holiday apartment is available on the day of your arrival from 4 pm and we would ask you to check out on the day of your departure before 10amg. This is to make sure that the holiday apartment can be prepared for the new guests. the routing function of web.de. 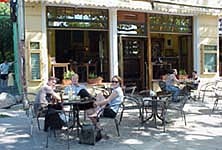 The house is situated in the "scene-area" of Berlin - close by to the Kollwitzplatz and water-tower, one of the most-frequented club and bar centres in the new Berlin. the Mauerpark and at the end of Bernauer Str. the Gedenkstätte Berliner Mauer - an open air museum of the berlin wall (free of charge). So as you can see, you won't have time to be bored, even if you don't leave the immediate surrounding area. 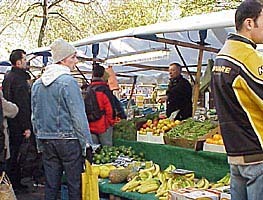 But don´t worry- the Hackescher Markt and the Oranienburger Straße in the district Berlin Mitte or further parts of the city are easy to reach. You have connection to underground, buses and trams. And if you are in a hurry: a taxi stand is around the corner. 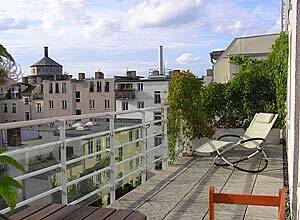 It is just a 10 minutes walk to Alexanderplatz. 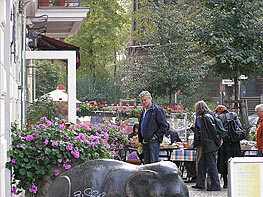 Prenzlauer Berg, or more simply Prenz'lberg, is one the most popular residential and 'happening' districts in Berlin for nightlife. 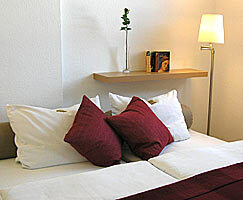 This apartment is made available by Privatzimmer Sens, Agency for holiday apartments and guest rooms in Germany..